Lots of things are happening on the SoCal legal front. To start with, Julianne Thompson of Carlsbad has pleaded not guilty in the hit-and-run death of 64-year old cyclist Arthur Jacobs; she was found hiding in some nearby bushes shortly afterwards with a blood alcohol level over three times the legal limit. Thompson faces up to 15 years on charges of gross vehicular manslaughter, hit-and-run and drunk driving. According to the stories, she’s remorseful. Yet the victim is still dead. So how does that balance out? Sources tell me that Adam Carl Garrett, the 19-year old driver accused of killing cyclist Hung Do in a Fountain Valley hit-and-run then calling police pretending to be a witness, has been charged with misdemeanor hit-and-run without gross negligence and hit-and-run with permanent and serious injury. As members of the LAPD have repeatedly pointed out, charges are based on what the DA or City Attorney’s offices think they can prove, rather than what police believe really happened. 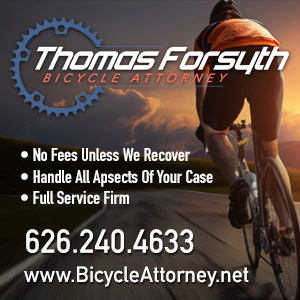 Without witnesses, and with the additional time for any possible intoxicants to pass out of the driver’s system allowed by the hit-and-run, it would be very difficult to make stronger charges stick. I’m also informed that the family of Amine Britel, the Newport Beach triathlete killed while riding in a bike lane last February, has filed a lawsuit against the driver. Danae Miller was reportedly texting and driving under the influence when she hit Britel’s bike from behind; with her driving record, I’d recommend settling quickly. Word from the LAPD indicates that charges will soon be filed — if they haven’t already — in the hit-and-run death of Alex Romero, the 17-year old cyclist killed by a speeding car while riding with a friend on De Soto Ave. last April. And charges may not be limited to the driver; they could include others who allegedly attempted to help her cover up the crime. 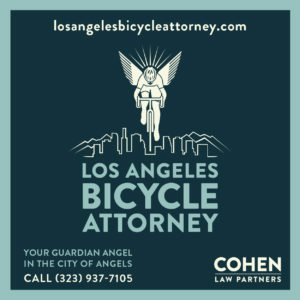 Renew your membership or make a donation to the LACBC now and AdventureCorp will match it up to a total of $10,000 in honor of fallen endurance cyclist Jim Swarzman. Get a first look at the newly unveiled draft of the Santa Monica Bike Action Plan when the Santa Monica Spoke hosts a meeting with Santa Monica Deputy Director Lucy Dyke tonight from 6 pm to 8:30 in the Colorado Community Room, 502 Colorado Blvd. Meanwhile, West Hollywood’s Bicycle Task Force proposes a bold plan to make the city more bike friendly, including removing parking spaces to extend bike lanes along busy Santa Monica Blvd and a road diet on Fountain Ave. to create a protected bike lane along the curb. Not to mention aligning other proposed bike lanes on Fairfax and Vista/Gardner with bike lanes included in the new L.A. bike plan. We can only hope bike-unfriendly Beverly Hills is paying attention, and plans to do something about that gaping black hole marring biking on the Westside. And needlessly risking the lives and safety of everyone who lives and rides there. The L.A. County Sheriffs Department is looking for a stabbing suspect who killed a man along the L.A. River Bike Path in South Gate; if you rode the trail the last Friday in June, maybe you saw something. An investigation is underway as to whether or not these accidents were intentional, police said. It’s time to rethink North Figueroa. Streetsblog looks at the less-than-promising Woodley Ave. bike lanes. 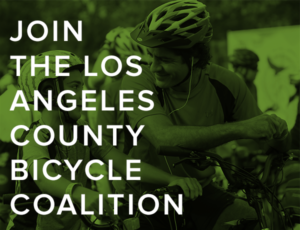 LADOT wants your help to survey L.A. bike racks. Metro moves forward on bike share. Full bike parking at the Grove. Those of us born with an competitive gene have to be reminded from time to time not to underestimate anyone; I have to fight the urge to ride down anyone on the road ahead of me. Funny how often the Times photo of the day features bikes. Will gives new meaning to L.A. River Ride by actually riding in the river to connect the gaps in the trail. The South Bay section of the beachfront Marvin Braude Bike Path is about to get a much needed facelift; hopefully the county will get to the cracked and crumbling Marina section before it completely falls apart. Ashley Tisdale rides with her dog in Toluca Lake. An update from Amarillo on the L.A. firefighters riding across the country to honor victims of 9/11. More information on Cody Wessel, the 19-year old Wildomar cyclist who was killed in nearby Lake Elsinore on Friday. Bike thefts are up in Newport Beach, where police search for Ashton Kutcher and Colonel Sanders. A blind cyclist rides a tandem 240 miles from Santa Barbara to San Diego. A Santa Barbara writer says we could solve a lot of problems with those three little words: share the road. 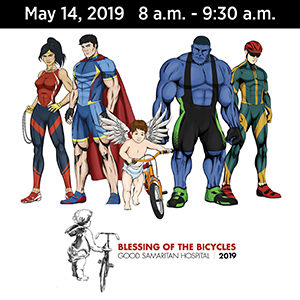 An SB teen is riding across county to raise money and awareness for a program allowing the homeless to live safely in their cars. The Bay Area is facing a pedicab war; yes, Microsoft Word, pedicab is a word so get over it. I missed the unique importance of these new microwave red light sensors in Pleasanton the first time around; thanks to Road.cc for the clarification. Palo Alto attempts to calm traffic and build boulevards. A bike path that doesn’t connect to anything may be a waste of money, but some idiots still don’t get it — it’s the cyclists who are subsidizing the roadways, not the other way around. African American cyclists get blessed in Oakland in an attempt to get more on the road. New Tron-style wheel rim lights could keep you safer at night. How to not be invisible when you ride. Cycling is good for you, even if you’ve been a couch potato. A graphic illustration of why bikes are good for rural economies. This is why you don’t buy cheap carbon frames off eBay. How is it that Sitka AK is bike-friendly and L.A. isn’t? Misdemeanor charges for killing a Colorado cyclist. It wasn’t easy coming up with that crappy name for the upcoming USA Pro Tour Cycling Challenge; after a top 10 finish in the TdF, Colorado’s Tom Danielson could be one of the favorites. A thief who stole seven bikes from Idaho’s World Relief returns three with an apology. Newly minted Montanan Dancer a la Mode sends word of a DUI fatality that’s gripping the local community. Oklahoma authorities have arrested a suspect in the 2009 hit-and-run death of an 8-year old girl; there’s not a pit in hell deep enough. A Chicago cyclist is killed on her way home from Lollapalooza after falling underneath a dump truck. Massachusetts authorities can now ticket cyclists, but can’t force them to pay. Turns out bike share saves lives; I wonder if the results would be the same here in L.A. with our lack of cycling infrastructure. How to be an ambassador for cycling. Southern California isn’t the only place where cycling fatalities are on the way up. Pro cycling’s most successful team is folding at the end of this season, while star rider Mark Cavendish may jump to Team Sky; thanks to George Wolfberg for the head’s up. Cycling prodigy Taylor Phinney will compete in this year’s Vuelta a Espana, after winning his first stage since turning pro. Israel revokes their mandatory helmet law for adults. Three years in prison for a rickshaw jockey who chewed off a cyclist’s ear in a road rage incident. Finally, the unofficial highlights of the Tour de France. And a cyclist rescues a crawfish from the mean streets of Salinas. If you missed Sunday's Brentwood Grand Prix, you missed some great racing. Don't make the same mistake next year. According to the Orange County Superior Court website, Adam Carl Garrett’s arraignment is scheduled for August 29, 2011 at 8:30am at the Westminster Courthouse in Dept. W14.